What’s more, event organiser Kelvin Newman announced that September’s conference will be held at a bigger venue, the Brighton Centre, after April’s 1,700 tickets sold out in under 60 seconds. Those SEOs who managed to shoehorn themselves into April’s event at the Brighton Dome may have spotted an unofficial theme for the day. By our evaluation, emotions were either central to, or a major part of, every presentation we attended. 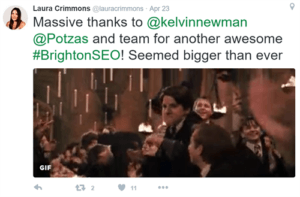 The crowd loved these BrightonSEO talks, created by some of the top SEO minds on the planet. Erica McGillivray, Senior Community Manager at Moz, spoke about how your online community’s emotions are vital to the success of your brand. “Nothing speaks more about a brand than how big their community is and how happy their community is, too,” she said. Neuroscience expert Amy Brann spoke about how we can build trust and improve the emotional connection with our audience, both in the physical world and online. During their talk, Lisa and James surprised the audience by launching a brand new sentiment tracking tool: Lava. The tool tracks newspaper sentiment over time and provides a list of articles which reference your brand or search term. Greg Gifford spoke about Local SEO – targeting a specific geographic area. He explained how understanding what people in a given area will actually enjoy reading can transform your local SEO. Hannah Butcher used her status as both a blogger and an SEO to explain how bloggers feel when we’re looking for links from them. “Bloggers have a niche demographic of people with a real passion for your subject,” said Hannah. “They may be able to reach exactly the right people for your brand.